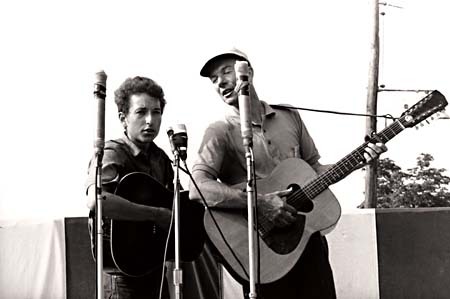 When it was announced early today that folk legend and social activist Pete Seeger had passed away of natural causes in New York at the age of 94, a long thread of the American musical tapestry unravelled. Seeger’s epic musical and political career wove through the Works Project Administration Music Project, Aaron Copland, the labor movement, the Dust Bowl migration, Woody Guthrie, McCarthyism, the Civil Rights movement, Bob Dylan, and Barack Obama‘s inauguration (at which he sang Guthrie’s “This Land is Your Land” on the steps of the Lincoln Memorial with Bruce Springsteen). In many ways, this troubadour with a banjo and a high, lonesome tenor is the archival musical DNA of 20th Century American Song. He is certainly its conscience. 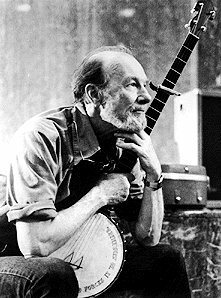 The son of a violinist mother and a musicologist father, Seeger came to embody (and to a large extent, to popularize) the authentic, indigenous American musical voice, from slave spirituals to Appalachian bluegrass. His version of Leadbelly‘s “Good Night Irene” hit number 1 in the 50s (released with his band the Weavers) and his revival of classics like “Shenandoah,” “Mary Don’t You Weep” and “Old Dan Tucker” introduced new generations to the broad sweep of America’s rich musical heritage. 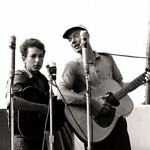 His songs “Where Have All the Flowers Gone,” and “If I Had a Hammer” became anthems of the antiwar movement in the 60s, while his folk reinterpretations of Bible verses (“Turn, Turn, Turn,” later released by The Byrds) and spiritual ballads “(We Shall Overcome”) became the soundtrack to the Civil Rights movement. He was in the union halls and labor rallies in the 40s, in the halls of Congress defending his craft and his views in the 50s, and was even in Newport in 1965 when Dylan went electric, threatening (according to legend) to chop Dylan’s amplifier cord with an ax. 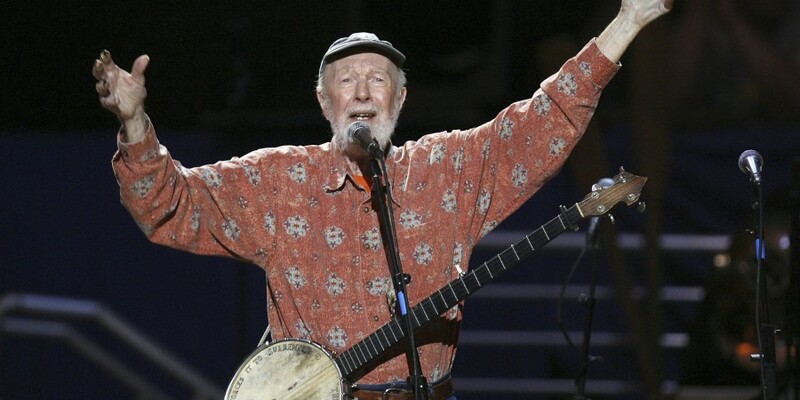 A staunch patriot, but a self-described “communist with a small ‘c,'” Seeger’s career suffered for his unapologetically strident political views, and he was blacklisted during the McCarthy era — a ban that lasted through his appearance on The Smothers Brothers Show in 1968. His political activism continued throughout his career, most notably through his establishment of the Hudson River Sloop Clearwater, a clean water project which protects the Hudson River Valley watershed. 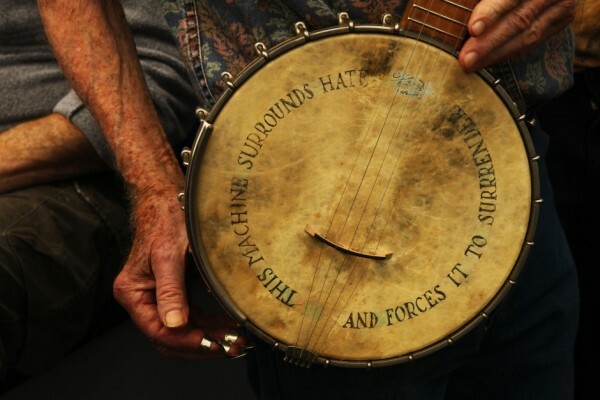 Seeger received a Grammy Lifetime Achievement Award in 1993, the National Medal of Arts from the NEA in 1994, Kennedy Center Honor (also in 1994) and was elected into the Rock and Roll Hall of Fame in 1996.